S-Video cables are commonly used for video interconnect between home cinema components or PC video cards to TVs etc. An S-Video cable carries the video signal in two parts, Luminance (brightness) and Chrominance (colour). This provides far superior picture definition than composite video cables. An s-video lead with a 4 pin mini din connector on each end. Metal bodied connectors with gold plated contacts provide the ultimate in signal transfer for bright, colourful crisp pictures. Manufactured from fully shielded oxygen free copper (OFC) high definition cable, these leads represent fantastic value for money. S-Video is a two component signal, luminance (brightness) 'Y' and chrominance (colour) 'C', often referred to as Y/C or Y-C. The separate components of the video provide a far superior picture to that of composite video. Ideal for connecting DVD, PC, VCR, digi box, satellite, camcorder to amplifiers and televisions etc. 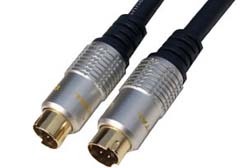 Profigold by Bandridge PGA4205 5m high quality stereo audio cable, 2RCA/Phono - 2RCA/Phono. Enjoy superior home cinema and high definition sound with this top quality cable. Features 24k Gold Plated phono contacts ensure optimum signal transfer. 99.96% OFC conductor for high definition sound quality. Cellular PE insulation ensures a clean natural sound. Long lasting sound quality. Die-cast connectors. Lifetime limited warranty against defects or workmanship. Profigold PROI3302 2m IPod audio cable, potable audio interconnect. Profigold PROI3302 Ipod audio cable for portable audio and mp3 players. Superior grade 99,996% Oxygen Free Copper conductors, for lowest possible signal loss. Multiple cable shielding, for maximum protector against radio frequency interference. 24k hard gold plated contacts for excellent protection against corrosion. 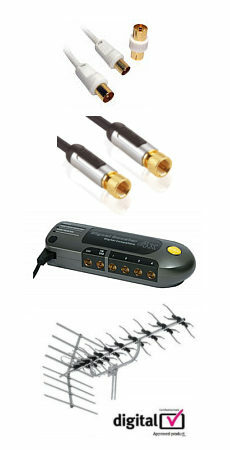 Pearlized chrome plated metal connector with metal inner case, for maximum reduction of RF & EMI interference. Superior flexible whiter outer cable jacket, to avoid cable twisting and cable fracture. Color coded plugs for easy and secure installation. Precision silver soldered contacts, for minimum transition resistance. Slim-line 3.5mm connector, complies with Apple iPod, iPhone and iPad. Interference Absorption Technology to eliminate interference in the data transfer. Length 2 metre.